While I miss on my dose of the Kolkata Durga pooja fever, I’m getting ready to celebrate the US style Durga puja. I will definitely miss the phuchka, alu kabli, churmur, ghugni – oh I cant stop writing the list of road side food that I’ll be missing on this puja – but would have a new taste, a new experience of celebrating puja just over the weekend. The street food on Kolkata adds an added charm to the whole flavor of Durga puja, but there is always the home cooked prasad. Though my family strictly becomes vegetarian during the four days of puja, mainly because of the fact we have our own durga idol at home, and she has been worshiped in the family for more than a century now. And, as Ma Durga is bid adieu, the next day, ekdashi is the day to eat fish and only fish. The entire family with brothers, sisters, cousins, their spouses, their kids – you know how the Indian family tree is – eats, sitting on the floor. Last year I was heading the frying department of the lunch, mostly because my mom felt her daughter is old enough to get married so she is old enough to cook for hundred people, or at least the dal and bhaja part. So, my task for last ekdashi was to make loitta macher vada for the entire family. It was intimidating, it was tiring, yet there was a satisfaction seeing everybody asking for more. To start with the festivities here’s a simple recipe for kalakand using ricotta cheese. Kalakand apparently a Rajasthani dessert, was first introduced in the late 40s and since then it has become one of the favorite Indian desserts. 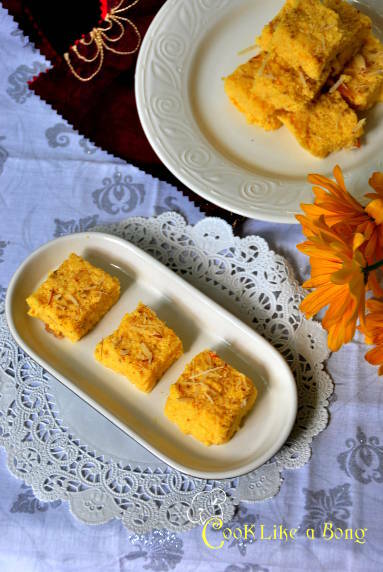 And, when it comes to Bengalis we just love sweets. And, for all of you 2013 puja time table is here. Heard about bengali sweets being famous all over the world. Wonder what is there which is not present elsewhere ? I grew up in Bangalore and loved eating Bengali sweets from K.C Das sweets . woowww…mouth watering…but unfortunately we don’t get ricotta cheese here…so could you please suggest anything to substitute that? Instead of ricotta cheese you can just use simple chana. But knead the chana for at least 5-6 minutes with the inside of your palm before you add the condensed milk. You’ll feel the chana becomes greasy and softer. It will loose its crumbly texture once you knead it well.